Kusal Mendis, who put up an unbeaten 163-run stand with Oshada Fernando to take Sri Lanka past the finish line in the second Test match against South Africa, jumped 11 points to enter the Top-20 of the ICC Player Rankings, it was announced on Sunday. 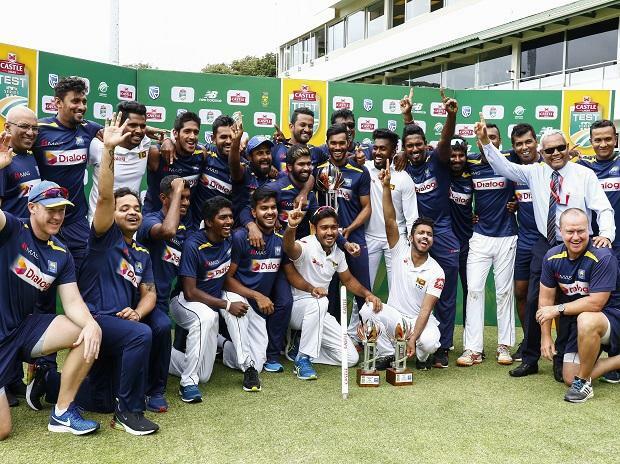 Sri Lanka's eight-wicket victory in the second Test in Port Elizabeth completed a historic 2-0 sweep over South Africa, making them the first Asian team to win a Test series in the country, according to the ICC's website. Mendis, who was also adjudged Player of the Match is now sitting at 18th spot. Fernando also gained in the rankings, sitting at No.65 after jumping 35 spots with a career-best rating of 455. Niroshan Dickwella, who scored an important 42 to take Sri Lanka's total past 150 in the first innings, advanced eight places to grab the 37th spot. South Africa players, predictably, slipped down the rankings. Dean Elgar, who scored just 43 runs in four innings, moved down by seven spots to No.23. Temba Bavuma also slipped to No.38 (down by five spots). In the bowlers' rankings, Duanne Olivier and Suranga Lakmal climbed three spots each to No.19 and No.30 respectively. Though South Africa had average returns with the ball, Olivier had a decent series, claiming seven wickets in two games to break into the top 20 early in his career. Vishwa Fernando, the leading wicket-taker with 12 scalps, moved up six places to No.43. There was no change in the top 15 in the all-rounder's rankings, with Jason Holder retaining his position at the top of the pile.